Meteors are the collective phenomena associated with naturally occurring space borne objects such as dust or rock larger than 0.1mm in diameter which enter the Earth's atmosphere and are heated to incandescence by friction with the air. The origin of the word meteor is "meteoron", a Greek term meaning phenomenon in the sky. Most meteors disintegrate within seconds at altitudes between 80 and 110 kilometers ( 50 and 68 miles ). Others are large enough that their mass carries them through the atmosphere and back into space. 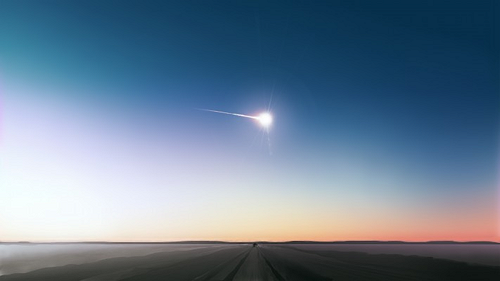 Large meteors produce spectacular fireballs that are easily seen in broad daylight. Regardless of size, meteors do not impact on the Earth's surface. The moment that a meteor collides with the Earth it becomes a meteorite. Meteors which explode during their path through the atmosphere before they reach the Earth's surface are known as Bolides. The Chelyabinsk Meteor ( pictured above ) became a bolide whe it exploded at a height of about 23.3 km (14.5 miles). The explosion generated a bright flash, producing many small fragmentary meteorites and a powerful shock wave. In ufology, meteors are one of many natural phenomenon that can lead to a UFO report. However they are also often the easiest to identify as being a natural phenomenon. Unlike the radical maneuvers sometimes performed by UFOs, meteors are essentially just falling chunks of rock that do not alter course. Small pieces of them have also been found and analyzed. Meteors can appear in a variety of colors depending on their composition and the temperature they are heated to during atmospheric entry. at about 03:20 UTC at over 41,000 mph.